But unfortunately, I was let down. It had such promise and interest with the storyline, but the film resorted to basic scare tactics that tried to make you jump out of your seat. Scarlett, a young archeologist, discovers a possibility of the existence of the Philosophers Stone, which can grant wealth and everlasting life. 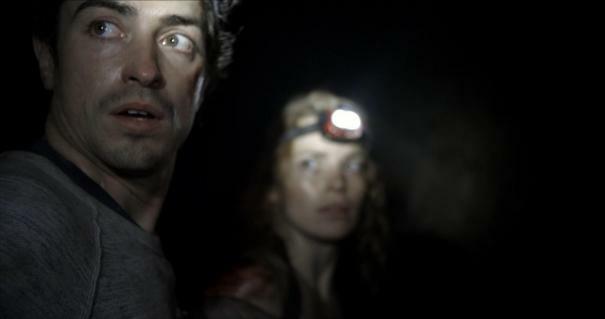 Scarlett goes to find someone who can take her to the part of the catacombs no one can get to, and that’s where the filmmakers wanted us to think where all fell broke loose. But again, it was a let down. It’s filmed in a documentary format, and the filmmaker is on the journey with them. So if you’re not a fan or get sick of the found footage angle, you might get sick or find this hard to follow. It’s obvious from the start of the descent that their party will be picked off accordingly. One by one, the team discovers their greatest fears as they go lower and deeper into the deep dark catacombs. Only of they embrace them, will they survive. Kind of lame right? I thought so too. It has predictable scares and obvious scary movie plot holes. I get what they were trying to do with this, but instead of telling a cohesive story with engaging characters, they opted to try and bait and scare us too much. If you were hoping this was the horror film you’ve been waiting for this summer, you’ll have to keep waiting. This entry was posted on Friday, August 29th, 2014 at 2:37 pm	and is filed under Film, News. You can follow any responses to this entry through the RSS 2.0 feed. You can skip to the end and leave a response. Pinging is currently not allowed. « Film Review: ‘The November Man’! !